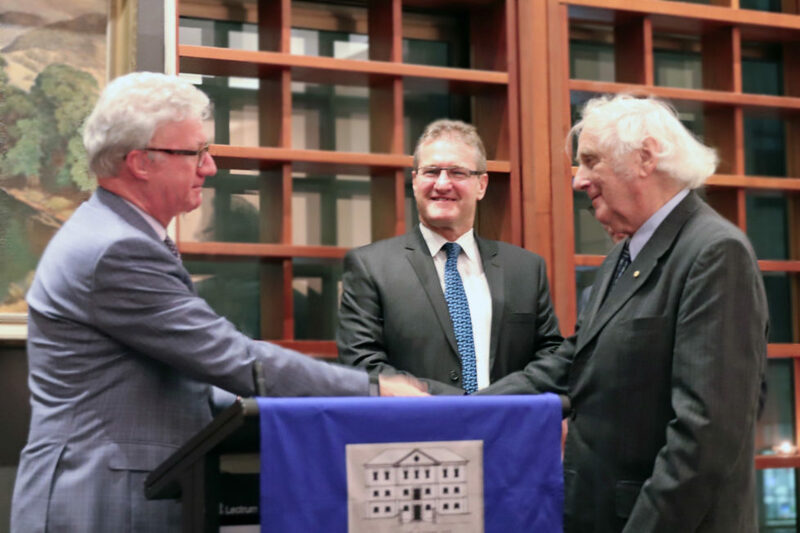 Emeritus Professor Blainey has, through his research, publications and involvement with the historical community, provided new insights into Australian history. Emeritus Professor Blainey has researched and written on a large range of topics, including mining history, economic history, race relations, religious history, and Australian society. His first book, The Peaks of Lyell, published in 1954, began his long interrogation of Australian social progress, which became further apparent through his 1958 text Gold and Paper: a history of the National Bank of Australasia, The Rush that Never Ended: a history of Australian mining (2003), Black Kettle and Full Moon: daily life in vanished Australia (2004) and his recently published work, The Story of Australia’s People. Blainey’s curiosity in Australia’s unique relationship with the world precipitated his most renowned volume Tyranny of Distance, released in 1966 and re-published to this date. This seminal Australian history text examines how geography has historically affected the lives of Australians and tempered Australia’s relationships with the wider world. Blainey’s academic appointments at the University of Melbourne, his advice to the Federal Government towards the establishment of the National Museum of Australia, and his positions on the Australian Council and Australian War Memorial Council have further strengthened the role historians play in Australian culture. Blainey has been the patron of the Australasian Mining History Association since its formation in 1994. Aside from these formal positions, Professor Blainey’s extensive publication record totaling over thirty volumes has allowed a wide audience of Australians to access history. Professor Blainey has been recognized for his contribution to historical scholarship, public debate and public service by his recognition as a ‘Living Treasure’ by the National Trust in 1997. He was appointed an Officer of the Order of Australia in 1975 as an initial recipient of the new Australian Honours system, and became a Companion of the Order of Australia in 2000. He became a Fellow of the Australian Academy of the Humanities in 1969 followed by his election to the Australian Academy of the Social Sciences the following year. Internationally he was awarded the Britannica Award for Disseminating Knowledge in 1988. His acclaimed study, Causes of War was one of the reasons he was recognized by the United Nations in 1988 as a global intellectual along with Kenneth Galbraith and Octavio Paz. Blainey has an extraordinary command of various forms of historical data. His knowledge of economic history, using statistics and other hard data is visible throughout his histories of mining regions such as Peaks of Lyell (1954) and his history of MIM, as well as in banking history and in mega-forces of development discussed in Tyranny of Distance. His pioneering study Triumph of the Nomads (1966) skillfully employs the use of paleontology, climate change, geography, anthropology, geology and archeology to produce an innovative study of deep time. Very few historians have the capability to traverse so many disciplines with proficiency and determination. Professor Blainey is a persuasive and accomplished presenter of his arguments. Blainey has the rare ability to go from minutia of regional development and mining history to deep time and sweeping millennia. He marshals his evidence with care and precision, his arguments never tedious or obscure. In conclusion, Emeritus Professor Geoffrey Blainey is a deserving recipient of the 2017 John Douglas Kerr Medal of Distinction. Photos taken at the Queensland Day Dinner by Lee Beanland.